A man broke the jaw of his former partner just six weeks after being given early release from a jail term for a previous vicious attack. William Adamson, from Kirkcaldy, launched a brutal attack on the mother of his three children after offering her accommodation after she had a night out with friends. He knocked her down and repeatedly kicked her in the head, leaving her with a double fracture to the jaw which required extensive surgery. The thug has now been sent back to jail for a total of three years and nine months after appearing at Dunfermline Sheriff Court yesterday (Friday). 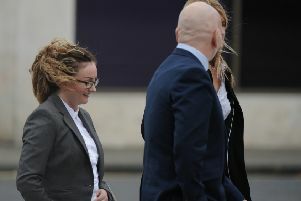 Adamson (33), a prisoner at Perth, admitted on June 5 in Leslie Street, Kirkcaldy, he assaulted Lisa Anne Templeton, his former partner, seized her by the body, struggled with her and repeatedly kicked her on the head, all to her severe injury. Adamson had been jailed in June last year for a serious assault on the same woman. He was released early under a home detention curfew scheme. Ron Hay, depute fiscal, previously told the court that the couple had been in a relationship which had broken down because of domestic abuse. On June 4 Ms Templeton had been having a night out with friends. Since he had been released, relations between the couple had been described as “amicable” in their dealings over child access and Adamson had invited her to stay the night at his mother’s home after her night out. “She arrived at around 4.30am on June 5 and was confronted by the accused who demanded to know who she had been with,” said Mr Hay. There was a struggle, Ms Templeton fell to the ground and as she lay there she was kicked in the face, said the depute. A witness then went to see what was happening as Adamson kicked his victim in the face for a second time. As Ms Templeton walked down stairs to leave she was followed by Adamson who grabbed her by the body. “Once again she ended up on the ground and once again he kicked her in the head,” said the depute. Adamson then left the property and was apprehended by police at 5.35am. The victim was taken to hospital with bruising and swelling to her face. It was discovered that her jaw was broken in two places and she required surgery to have two metal plates inserted, said Mr Hay. At the police interview Adamson said his former partner was a liar and she had fallen down the stairs. Sheriff Charles Macnair sent him back to prison to serve nine months from his previous sentence and jailed him for 36 months for the latest assault, making a total sentence of 45 months starting yesterday. He told Adamson, “You were released from prison and it was just six weeks before you were carrying out this vicious and sustained attack on your former partner, who had also been the complainer in the previous case. The sheriff said it was clear Adamson posed a “significant risk” of further offending and imposed a 12-month supervision order to start when he is released. In June last year, Adamson was jailed for 28 months for choking Ms Templeton and putting her life in danger in an incident at Kinninmonth Street, Kirkcaldy, in March 2014.